Dr Ben Griffin, winner of the coveted Royal Historical Society Whitfield Prize, reveals why he challenged traditional assumptions about the struggle for women's rights in his book, 'The Politics of Gender in Victorian Britain'. In explaining the revolutionary changes that happened in just a few decades, Dr Griffin argues that changes to women’s rights were not simply the result of changing ideas about women but also changing beliefs about masculinity and reveals how the behaviour and ideologies of male politicians were fundamentally shaped by their gender. The Politics of Gender in Victorian Britain sets out to explain dramatic changes to women’s rights in the nineteenth century. It describes a lost world in which married mothers had no right to the custody of their children, married women were not allowed to own property and women could not vote or go to university. I have tried to make sense of how Victorian men justified these inequalities and then explain how and why legal privileges that had sustained male power for centuries were swept away within the space of a few decades. When I started my research, my aim was to identify the MPs who supported feminism in the nineteenth century by looking at the voting behaviour of over a thousand MPs. I soon realised that we cannot explain the development of women’s rights as the result of a straightforward clash between camps of ‘feminists’ and ‘anti-feminists’. The behaviour of the men I looked at defied such easy categorisation, and couldn’t be explained by the existing historical literature. How can we explain men who supported women’s suffrage but opposed giving mothers child custody rights? What was going on? Alexander Beresford Hope (circa 1870s) – a ‘notoriously hen-pecked husband’. Photo: Public Domain. After years of research, I concluded that these patterns could be explained in terms of three broad trends. First, I have been able to show that changes in religious attitudes can explain fluctuations in support for women’s rights. Second, I realised that men’s views on women’s suffrage were influenced by dramatic changes in men’s ideas about the nature of the political system in the final third of the nineteenth century. This means that part of my book has developed into a history of how Britain came to think of itself as a democracy. Third, and perhaps most importantly, I realised that we cannot explain support for women’s rights simply in terms of beliefs about femininity and the proper role of women: these debates were also debates about the roles and responsibilities of men. Therefore, the book argues that changing Victorian attitudes to marriage, fatherhood, and what it meant to be a man, profoundly shaped the behaviour of male politicians. This idea seems to have captured the imagination of the book’s reviewers, because it suggests that most political histories have ignored a crucial variable in explaining political conduct – the history of masculinity. The ideas that politicians held about what it meant to be a man shaped the laws that they made; these ideas also shaped the public images that politicians constructed and the ways in which MPs interacted. The chapter that has received the most interest (and which was the most fun to write) is the chapter where I describe how the credibility of politicians depended on their ability to appear ‘manly’. MPs who fidgeted, or who drank too much, or who failed to find a middle ground between dressing too flamboyantly and too shabbily, were unlikely to be taken seriously by their colleagues. Politicians used the parliamentary stage to demonstrate their ‘manliness’. This was an opportunity particularly valued by those men who fell short of the Victorian ideal of the married paterfamilias ruling benignly over wife and children. One of my favourite bits of the book looks at the most vocal opponents of women’s suffrage and compares the content of their speeches with the reality of their lives. Although these men loved to pose in their speeches as ‘manly’ defenders of the patriarchal order, in truth most of them fell far short of the ideal. Some, like Charles Newdegate and Sir Henry James, were well-known to contemporaries as unmarried mummy’s boys; others, like Alexander Beresford Hope, were notoriously hen-pecked husbands. This focus on political performance can deepen our understanding of both the opposition to women’s rights, and the vested interests that male politicians had in the status quo. The implications of this extend beyond the history of nineteenth-century Britain. My analysis suggests that the behaviour of male politicians will always be influenced by historically distinctive forms of masculinity. This in turn underlines the significance of the fact that only 22 per cent of MPs are women at the moment. One thing we can learn from studying the Victorians is that sexual inequality in political representation can have profound effects on the laws that bind and protect us and on the ways in which we are governed. The politics of gender continues to affect us all. 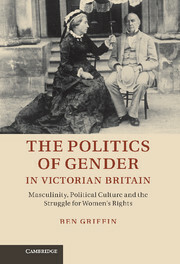 Dr Ben Griffin is the author of The Politics of Gender in Victorian Britain (out now), for which he won the Royal Historical Society Whitfield Prize. He is a Fellow and Lecturer in History at Girton College, University of Cambridge.